Most people would assume going off to live at school for seven years wouldn't be a good time. Those people are obviously muggles. Cause really, heading off to wizarding school could never be considered boring. Think you got up to trouble in high school? That's nothing compared to the mischief kids get up to at Hogwarts. No country road drives, instead it's all about flying around the Forbidden Forest via broomstick. No Friday night football, instead all the gossiping and cheering is done from the Quidditch stands. And you'd better believe those practical jokes get to a whole new level of crazy. So while students might have to wear uniforms all year round, you can bet their day-to-day is always sure to be unpredictable. You'll feel timeless and magical in this pleated Gryffindor skirt. 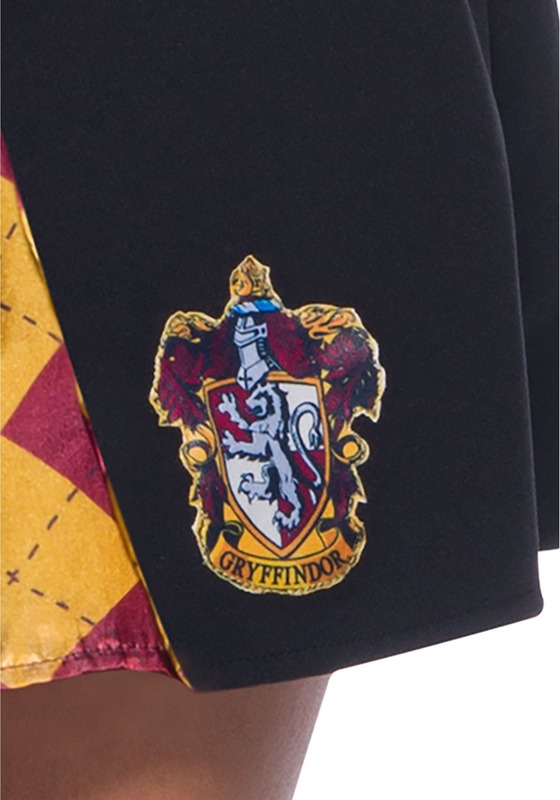 The official Harry Potter licensed skirt has a Gryffindor shield and argyle pleats inserted throughout. The silky pleats are in the Gryffindor colors so everyone will know what house you're from at a glance! Want to head into the smart world of wizards? It's not all mischief, there's some studying involved in there as well. Pair this skirt with the rest of our accessories to make your Hogwarts look complete. Who knows what might happen when you hit the books this Halloween?